Monitor Computer software allows to monitor computer system in your absence through incarcerates screenshots at a regular period of instance. Application creates a steadfast and sheltered screenshots of overall PC activities approximating system activities, internet activities, login name, voice chat conversations, login password & sound activities on a regular stage of time. Monitor Computer is password protected software and creates no any desktop icons on your desktops from those external users can never recognize about system monitoring. Keylogger software creates description of records data in html or text file system and work in completely concealed approach. Application includes a wonderful user-friendly graphical interface from that punter can effortlessly operate tool without any industrial training compulsory. Application is most admired surrounded by parents, internet cafes forensic analysis, system administrator, school and colleges for scrutinize computer system in sheltered, steadfast, cheaper and time expedient system. Monitor Computer software includes low system requirement for installation like 512 MB Ram, Pentium class or correspondent processor, 8 MB hard disk etc and supports all major Windows operating systems resembling Windows Server 2003, Windows Server 2008, Windows XP, Windows 7, Windows Vista and many more. 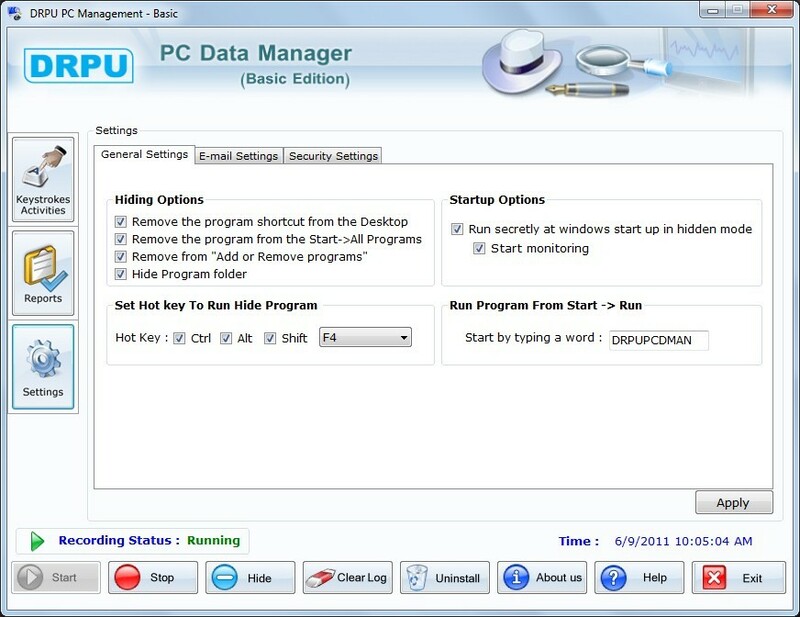 * Monitor Computer software provide a unique solution for monitoring PC in your nonappearance by screenshots at a customary hiatus of time in protected and steadfast system. * Application work in a secreted mode from that outside users can not identify about system monitoring. * Software creates records in html or text file format and provides facility to send log files by email and FTP server. * A cheaper and time convenient technique to monitor PC in your nonexistence. * Keylogger software includes an inimitable graphical user interface for simply access the application. PC Screen Spy Monitor - PC Screen Spy Monitor secretly captures all activity on your PC. It is like a invisible surveillance camera aimed directly at a PC screen. Takes a screenshot every X seconds (adjustable) without being detected. Power Spy Lite - Power Spy Lite secretly logs Facebook, Skype, keystrokes, chats & IMs, emails, web visits, video talk, logins, passwords, applications, searches and more. It also takes screenshots like a spy camera. Automatically sends logs to your email. Network LookOut Administrator Pro - The Network LookOut Administrator Pro allows you to see live screens of remote computers. This way, you can always see what users are doing on the remote computer. You can also take control of a remote computer by controlling the mouse and keyboard. Skype Spy Monitor Pro - Skype Spy Monitor Pro secretly records Skype incoming and outgoing IMs, calls and video chats. It runs completely invisibly so that Skype users won't know its existence. It automatically sends reports to an email or ftp like every 60 minutes. Power Spy x64 - Power Spy x64 secretly logs all Facebook, keystrokes, chats, emails, web visits, web cam images, user names, passwords, searches and more. It sends log reports to your email or ftp. You can check logs on another PC or your cell phone. Power Spy - Power Spy secretly logs Facebook, Skype, keystrokes, chats & IMs, emails, web visits, microphone, video talk, logins, passwords, applications, searches and more. It also takes screenshots like a spy camera. Automatically sends logs to your email. StaffCop Home Edition - This version of StaffCop is designed specifically for home use. Computers should be places where children can learn, make friends, and sharpen their agility as well as their abilities.